The season for breaking records at the tea auctions has begun early if one talks of Assam tea. Halmari tea of Assam, which has set a new record every time during second flush, has this time started a bit earlier and set a new record for first flush. Halmari has the record of Rs 600 per kg, which was set last year on July 28 at Calcutta auction during second flush. The first flush (March-April) is the first plucking after the dormant winter months. The leaves are tender and light green in appearance. The liquor is light, clear and bright with a pleasant brisk flavour. First flush Darjeeling is prized on account of its light and floral flavour whereas Assam is known for its second flush. The garden in Dibrugarh district of Upper Assam yesterday fetched a price of Rs 401 at sale number 17 at Calcutta tea auction. A total of 270kg of broken orange pekoe (BOP) grade of the CTC (crush, tear and curl) variety belonging to Halmari garden was bought by Subodh Brothers Private Limited. The tea was auctioned by J. Thomas & Co Private Ltd – the largest tea auctioneers in the world. The tea was plucked on March 28-29. BOP is a little bolder grade, which allows consumers to perceive the aroma and flavour to its fullest. It also provides a unique and very balanced combination of flavour and strength. Assam tea is a hot favourite among tea enthusiasts all over the world and is known for its characteristics of a rich malt flavour, fuller body, bright colour, briskness and sweet aroma. In fact, sale 17 at Calcutta witnessed some remarkable prices – Rs 384, Rs 391, Rs 394, Rs 397 and finally Rs 401. The Guwahati auction had seen some equally good prices – Rs 353, Rs 326, Rs 321. Tapan Dutt, owner of Subodh Brothers, said of the four lots which was on sale yesterday, this was the best. “This is the best first flush from Assam that I have ever tasted,” he told The Telegraph. Subodh Brothers has three outlets in Bengal – Salt Lake, College Street and Haldia. 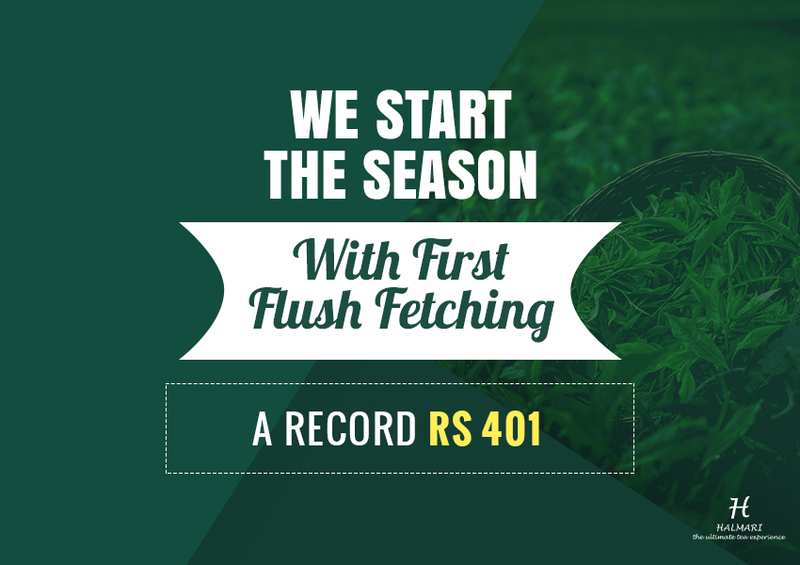 The company earlier this year had bought a first flush Darjeeling for Rs 11,000 a kg from Namring garden. D.K. Arora, general manager of Halmari, said there is a trend of tea lovers going for mellower cups. “The liquor in the first flush is light whereas in the second flush it is strong,” he added. The Amarawati Tea Company Ltd, which owns Halmari apart from Duliabam, produces around 9 lakh kg, of which 8 lakh is CTC. Harrods – London’s famous departmental store – for the first time has already included Halmari in its top tier tea range last year with eight other teas from across the world. It has also been featured in the February India edition of Robb Report, a luxury magazine. Soham Daga of Calcutta-based Amarawati Tea Company Ltd said it feels nice to get great feedback from the buyers and we aim to get some exquisite teas during second flush.